Financial Records are what you use to have an easy way to tell where all your money and assets are, and exactly how much you have, at any given time. They are not one document, or even one type of document. In fact, most people’s financial records will not look the same as anyone else’s, because each person has unique ways of organizing their information to make it most accessible for him- or herself. Your financial records are useful for many reasons, but they generally fall into two categories. First, they make it much easier to do financial planning (particularly managing your saving and investing). Second, they can be extremely important (often legally required) for tax purposes. When you set a savings goal, make a plan for how you intend to save it. If you get money another way, like a gift, don’t count it towards that savings goal, or you might have a hard time picking achievable goals later. When you are building or evolving your financial plans and setting new financial goals, you need to start with accurate financial records so you know exactly where you are starting from, and know exactly when you have reached your goals. For example, if you want to save $300 over the next 4 months, you need to know how much money you have now, and in 3 months you will need to be able to make the same measurements. If your current bank balance is $250 and you want to save up to reach $400, your savings goal would be to earn extra cash or trim your savings to reach it. If, however, you find an uncashed check for $150 from your last birthday in a pile of papers on your desk and deposit it into your account, you will hit that $400 target without actually accomplishing anything. This is one example of poor financial records hindering your ability to set and reach your targets. The government uses taxes and tax returns to try to encourage or discourage certain behavior, or to make some expenses more “fair”. For example, if you buy a car, you can usually get a partial return for the sales tax based on the vehicle’s value, how environmentally-friendly it is, or how much you use your car while at work as part of your job. This means that if you want to claim these tax returns, you need to have accurate documents on how and when you bought it, and odometer readings showing a very close estimates of how much you use your car for work. Without these documents, you can’t claim the tax returns, and can end up missing out on a lot of money. There are dozens of types of records, but the key is keeping them all organized. You can divide all your records into two big buckets – “Primary” records (which will be extremely varied and scattered), and “Secondary” records (which you will generally maintain yourself to keep your primary records organized). Even if you plan on always doing your taxes yourself, everyone should meet with a financial planner or tax adviser occasionally to discuss tax incentives they might be eligible for. 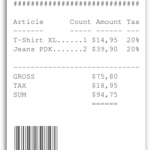 This will make it a lot easier to know which receipts are worth savings! If you want to claim any tax breaks, you will need to keep careful track of your receipts. These are the most basic financial record there is, just a piece of paper showing that a transaction has taken place. Depending on where you live, you should always save the receipts for large purchases (like your car’s bill of sale). Many cities also provide tax breaks if you use public transit, so it is also a good idea to save those receipts. They are also useful to keep beyond your taxes. For example, utility bills and receipts are often required as a “proof of address” when you want to open a bank account. If you get in a conflict at a later date over a bill being paid, having a receipt can shut down the problem immediately, while proving otherwise can be a long and drawn-out process. Your bank account will be one of your most important sources for financial records. Usually, your entire transaction history is saved for a few years (including every check you write), along with your current account balances. If you do not have a receipt for a payment (for example, if you write a rent check every month), you can still have a record of that transaction in your bank account. You will have different records available based on different account types. For example, if you have a savings account, you might have more records on deposit amounts and dates, with accumulated compound interest. If you have a checking (or “Current”) account, you will have your current available balances, along with your transaction history of your checks, debit card transactions, and ATM withdrawals. Your bank records will be an invaluable resource when you are building and changing your Spending Plan. Your income reports are statements showing how much money you’ve earned, usually along with how much income tax and social security you have paid, in a given year. The most common of these is the W-2 form in the United States, but you might have others if you are self-employed or work occasional odd jobs on the side. These are necessary to file your taxes, but are also useful to see how your income evolves over time. If you have any stocks, bonds, or other investments, you will also get regular account statements from your broker. This will include your cash balances (available for withdraw or purchasing more securities), the total net market value of your portfolio, the amount of any dividends you have received, the total expenses of your investments (this is most important with mutual funds). Your investment statements are essential for tax purposes. Unlike claiming deductions for receipts, you are legally required to report any investment income you receive, so having ready access to these documents will be essential. Not everything you own belongs on this inventory! Only include bigger items that have decent resale value, this will keep your list smaller and easier to maintain in the long run. Unlike the other primary records, this is one you will make and maintain yourself. Your personal property inventory is basically a list of what you own, where it is located, and its estimated value. This seems fairly simple when you are still in school, but there are more than a few cases of large amounts of cash stashed and forgotten. Also unlike the other records, your personal property inventory is not used for taxes. The main benefit of keeping and maintaining it is purely organization – knowing exactly where your things are, and how much they are worth, can be very useful when your life circumstances change and you want to sell (or give away) things you no longer use or might have forgotten about. The self-service storage locker industry thrives on people making monthly payments to save things they do not regularly use! Your secondary financial records are usually just bigger lists, putting together your different primary records into easy-to-read documents for your own personal reference. Usually these are reports you would put together yourself, but there are some cases where they would be automatically generated. After you’ve filed your income tax return, keep a copy for later reference. This also includes any receipts you have from taxes paid – these can be very important if you are audited one day. Legally you should hold on to all tax returns and receipts for 7 years, but it can be useful to keep them for longer if you want to occasionally work on long-term financial planning. 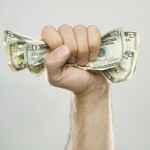 Your net worth statement can be one of the most powerful motivators to keep control of your personal finances! Until you know where you stand, it is very difficult to make and keep realistic financial goals. Your “Net Worth” is basically a sum of all your assets, minus all your liabilities, in one document. This is where you would add up your personal property inventory, investment values, bank balances, and cash you have squirreled away in a bunker in the desert, and subtract the outstanding balances of your credit cards, student loans, car loans, and home mortgages. This should be a one-page document you update every couple of months that helps you see your entire financial standing in one place. You might end up accumulating dozens of receipts in a relatively short period of time. Every few months, try to group them together and keep them in a safe place (for example, all receipts for “January – March 2016” kept in a folder in a fire-proof safe). While you do this, copy the amounts and the reason for the purchase into an excel spreadsheet. This will make it easy to know how much you spent and where you spent it for later. Plus, you can use your spreadsheet to quickly and easily find the original receipt later if you need it. By filing away all your receipts regularly, you make it less likely for any to get lost or accidentally thrown out. Doing it regularly is important to avoid a backlog (and so having to take an entire afternoon to file your receipts rather than a few minutes every few weeks). Now that you have all of this information, your main concern is keeping it safe. Identity theft is a major problem, and if someone were to get unauthorized access to just a few of your documents, they might be able to use it against you. For things like your tax returns, receipts, and investment statements, you might have paper copies that need to be both easy to find and secure. One possible route is to buy a small safe you can bolt to the floor, keeping your documents safe and all in one place. Historically, people have also rented safety deposit boxes (small ones can be about $60 a year), which is a trade-off of extreme security with inconvenience of needing to visit the bank in person and paying the annual fee. Despite what the movies show, most “hacking” is done not by forcing complex computer algorithms to hack a mainframe, but usually just because someone shares a password with someone they shouldn’t have. This goes not just for passwords, but other information as well – never give your account numbers, credit card numbers, usernames, or passwords over the phone or by email. If you absolutely need to share a username and/or password (sharing an account with a group, for example), make sure it is a username and password you don’t use on any other websites. You can’t tell which sites you use let the administrators see your password, and which use proper encryption. If you re-use the same usernames and passwords in many places, you’re increasing the chances that a disgruntled employee steals data and breaks into your other accounts. Even the most secure, unique password in the world is vulnerable to keyloggers – a type of virus software that records every key you press, and reports it back to the virus’s creator. Even if you don’t have a keylogger on your home computer (which can be hidden for months or years before “activated”, it is possible one might be on a computer lab or public computer you might access. Changing your passwords every few months is a good way to keep them safe. Some security experts recommend using a password manager. This is software that will generate extremely complex passwords for each website you need it for, then you just copy and paste with a click. Make it hard for someone to just get into your account by guessing, or a hacker just trying random letter combinations until they get in.This webcomic illustrates how this does not mean it has to be something difficult to remember, but there is no “golden key” to making sure your passwords remain secure. If keeping track of everything is a daunting prospect, see what kinds of services your bank or other financial institution can “bundle together”. For example, it is extremely common for a person to have their savings and checking accounts, investment portfolio, home mortgage, and credit card all through the same bank, and so they are able to access all of those financial records through the bank’s online portal. This has a strength of convenience, but there are also some serious drawbacks. For example, if you have your password stolen for this online banking service, you might lose access to everything all at once, costing a massive headache and potentially tens of thousands of dollars. Since you aren’t shopping around for the best rates on your different accounts (high interest for your savings, low for your credit card and mortgage, and the lowest possible fees for your checking and investment accounts), you will also very likely be getting a lot “less for your money” than if you shop around separately for each service. Even if you do not do so every year, taking some time to visit with a professional can end up saving you a lot of money in the long run. For example, they can help you tell when you need to save receipts versus not, saving you a lot of time and headache in organization, and they will help you tell exactly how to use them to claim all your possible tax credits. You might be able to remember the basics – if you have an expense that is used primarily for business, you can probably claim a tax credit on it. However, you might not know the exact process of claiming time you used your car while working, or if you can claim sales tax exemptions for new renovations on your home. Meeting with a tax professional or a financial adviser is the easiest way to navigate the seas of red tape and get the most out of your tax returns, and minimize how much time and research you need to spend on your financial records out of your own free time. If reading this article was an Assignment, get all 6 of these questions right to get credit! 1 of 6) Which of the following should not be included in your personal property inventory? 2 of 6) Which tool can you use to keep financial records? 3 of 6) Which of the following account management services would not be provided by a bank? 4 of 6) Which of the following expenses would not be tax-deductible? 5 of 6) Which of the following would you need to claim a tax benefit of a tax-deductible purchase? 6 of 6) Which of the following should you consider when choosing a password? A. Have you ever shared this password, or is it something anyone else would know? B. Have you ever used this password somewhere else? C. Is this password easy to guess?